Figure 6.2. Orbital parameters of the Moon and distances from Earth. Orbital inclination with respect to the ecliptic = 5.145 deg. Figure 6.3. The Earth-Moon system revolves about the barycenter some 4,600 km from the center of the Earth. The Moon rotates about that center at an average speed of 1,023 m/s, so any vehicle traveling from Earth must match that speed to orbit the Moon. (5,433 ft/s), and nominal escape speed is 2,342 m/s (7,683 ft/s). 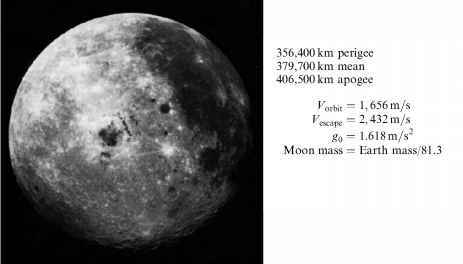 The acceleration of gravity at the Moon surface is 1.618 m/s2 (5.308 ft/s2). So the Moon's gravitational acceleration is about one-sixth that of the Earth. In Figure 6.3, for the Earth-Moon distance of 384,400 km (238,854 statute miles) the center of gravity (and rotation) of the Earth-Moon system is offset from the Earth's Center by 4,671 km (2,902 miles), that is, at 379,729 km (235,952 statute miles) from the Moon. That center of rotation is called the barycenter. The gravitational sphere of influence of the Moon, when it is at 384,400 km (238,854 statute miles) from Earth, is 66,183 km (41,124 statute miles). At that distance the gravitational influence of the Moon will be greater than that of the Earth and will therefore control the motion of approaching spacecraft. So in calculating the trajectory when the lunar sphere of influence is crossed, a conical patch is required to approximate the Moon approach trajectory. 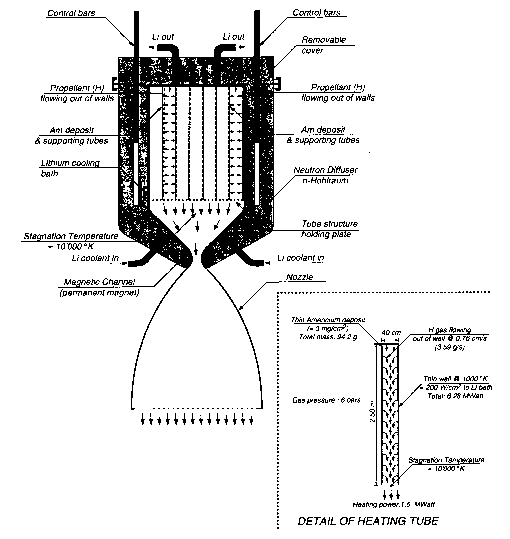 Since the conical patch is an approximation, the correct trajectory solution must be obtained by numerical analysis. The Moon travels around the Earth in a counter-clockwise direction at 1,023 m/s (3,356 ft/s), and added to the Moon's orbital velocity, nominally 1,655.9 m/s (5,433 ft/s) for a 50 km (31.07 miles) orbital altitude, this is the velocity that a spacecraft must possess to capture a stable lunar orbit. The Moon covers about 13.177 degrees per day (0.54904 degrees per hour) in its orbit, so the travel time to the Moon gives the lead angle at injection to the lunar transfer trajectory. Figure 6.4. Flight path geometry of the representative lunar trajectory. So the 66,183 km (41,124 statute miles) given in Figure 6.3 is for the 384,400 km Earth-Moon distance. The Earth-Moon distance varies, as said, from 406,700 km to 356,400 km with a mean of 379,700 km, so the lunar sphere of influence ranges from 70,023 km to 61,362 km, with a mean of 65,374 km (43,510 miles to 38,129 miles with a mean of 40,621 miles). 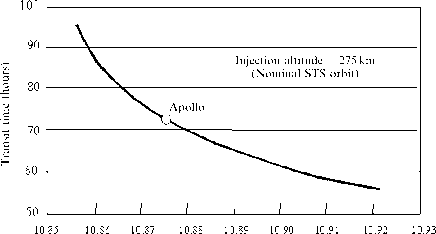 The lead angle for launch, in this particular case 27.9 degrees, is a function of the transfer trajectory time from injection to intersection of the Moon's sphere of influence. In all cases the injection speed into an Earth-Moon transfer trajectory is less than the Earth escape speed, 10,946 m/s (35,913 ft/s), so all of the lunar transfer trajectories are elliptical orbits. The minimum energy transfer ellipse is represented by a Hohmann transfer ellipse to the Moon's orbit, followed then by a propulsion burn to match the Moon's orbital speed of 1,023 m/s. This transfer orbit requires the greatest time to reach the Moon's orbit, that is 109.5 hours. The Apollo trajectory was designed to reach the Moon in less than that, that is, 72 hours. Remember the conical patch technique is very simple for planning interplanetary missions, but it is only an approximation for Earth-Moon missions and a precise numerical integration is required for any specific trajectory. However, the approximate approach does not influence the selection of propulsion systems for lunar missions, and is satisfactory for the purposes of this book. Figure 6.5. Earth orbit injection speed is less than escape speed, so the trajectory to the Moon is a transfer ellipse analogous to LEO to GSO transfer ellipse (Vesc = 10.946 km/s) [Brown, 1998]. of the injection speed had to be less than 1 m/s, at least (a difference of 0.01 km/s, or 10 m/s, can change the arrival time by 5 hours). The important fact is that all of the trajectories are ellipses and all eventually return to the Earth periapsis after completing a longer or shorter portion of the ellipse. So, errors in the exact trajectory will not "lose" a spacecraft in space. However, the time to complete an elliptical trajectory matters, and therefore the issue is acquiring the precise point of intersection between the transfer ellipse and the Moon's sphere of influence, as this point sets the rest of the trajectory to the Moon. A 1-s error puts this intersection over 1 km in error and can have serious impact on the resultant lunar trajectory, so timing is critical. This is not meant to make the lunar trajectory a technology challenge, but only to clarify the requirements. The late 1960s technology was adequate for at least eight Apollo missions to the vicinity and surface of the Moon.